Campus: Bihar has been seat of learning. A number of educational institutions have cropped up at many places of the state to cater the needs of rising population. Yet in the field of Technical Education we have a very few Technical Colleges. National Educational Policy, 1986 states that special efforts need to be taken to bring educationally-backward minorities at par with rest of societies & make them participate fully in National development activities. In this background Millia Educational Trust, Purnea established MILLIA INSTITUTE OF TECHNOLOGY, PURNEA with the help of eminent academicians, social workers & educationist to make it a Technical Institute of National level. The Institute is blessed with Sprawling Campus over 15 acres of land located in the heart of Purnea city amidst lush green surrounding. 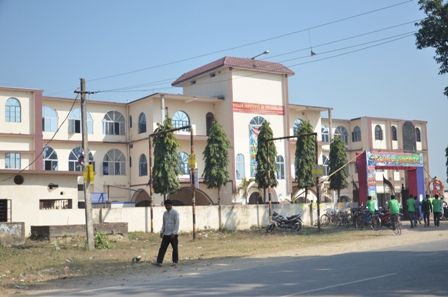 It has created & developed all the infrastructural & academic facilities in and around the campus to help & guide the students with modern computer centre, class rooms audiovisual system, internet connectivity centre, well equipped laboratory & workshop, with digital library, separet accommodation of boys & girls are also available. The institute has a team of qualified, dedicated teaching non- teaching professionals supported by a sound Placement & training cell. Publications, research, symposium & seminar organization are the main activities of the institute. Center library: Fully air- conditioned central library with over 20000 books by foreign and Indian authors covering 6400 titles. Besides 60 national and international journals and periodicals enthuse the learners to make extensive use of the library situated in a cozy environment. The library also subscribes for online periodicals with access to 1350 titles on latest trends and innovations in every discipline. The journals are also downloaded to benefit the students . Digital library facilities and computer systems enable the students to make free use of all media. The library functions from 8 A.M. to 8 P. M. on all working days and 8 A. M. to 2 P. M. on holidays. Hostel: Millia Institute of Technology has well furnished hostel for boys and girls . The boys hostel has 200 rooms and offers students the option of single , double and triple room occupancy. The girls hostel has 90 rooms and accommodates 200 students. Both the hostel provide dormitory facilities for students from economically weaker sections. The college also provides facilities like hot water, purified drinking water and 24hour power backup. The girls hostel is also provided with electric fencing for total security.The mess is run on the dividing system. Nutritious and hygienic multi cuisine food is provided for the students. The hostel are provided with indoor game facilities such as Chess, Table Tennis, Carom and Multistory Gym. Facilities for out door games like volley ball, basket ball, cricket etc. are also provided. A medical practitioner visits the hostels every day. I zaki ahmad want to know the fees for civil engineering with hostel facilities to be sent on my mobile number 07685083707.